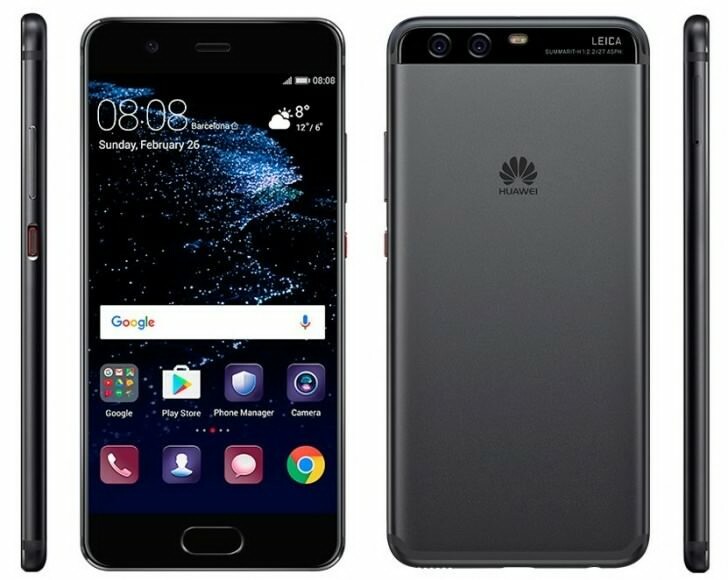 A few hours ago official-looking press renders of the black version of the upcoming LG G6 got leaked, and now it’s time for Huawei’s P10 to receive the exact same treatment. Once again it’s a dark-colored hue we can feast our eyes upon, though the P10’s back is not as shiny as the G6’s. The black (or dark grey) Huawei P10 will become official this Sunday at a press conference in Barcelona, ahead of the debut of Mobile World Congress. It will be joined by blue, green and gold versions – and we’ve seen these already in some leaked promotional images. The P10 should be announced on Sunday alongside the slightly larger P10 Plus, and they will both launch running Huawei’s latest EMUI 5.1 skin on top of Android Nougat. The new iteration of the UI overlay will be unveiled at MWC too, as will a new smartwatch. The P10 is expected to be powered by the Kirin 960 processor coupled with 4GB / 6GB of RAM. Internal storage will go from 32GB to 128GB, while on the back there will be a Leica-branded dual camera arrangement like in the P9 and Mate 9 .